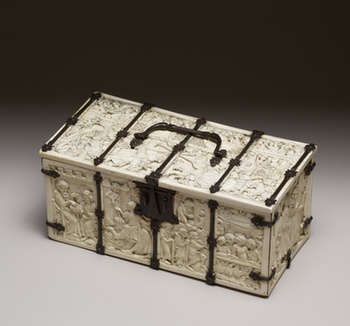 14th-century French casket with scenes from romance, including the life of Galahad. Image from the Walters Art Museum. Creative Commons license. As we discussed in class, the first Grail knight was Perceval, but Galahad eventually took centre stage. The image at the top of this page is from a medieval casket, but Galahad’s popularity outlasted the medieval period. He was a particularly significant character in the Arthurian revival, and this page offers you a glimpse of his appearances in 19th- and early 20th-century illustration and text. There is also some Canadian content, at the bottom of the page. There are more images of Galahad and the Grail at the ArtMagick site, and at the Camelot Project site (on the latter site, follow the link to Main Menu, which will give you a list of Arthurian characters, symbols, and places). I have made every effort to confirm that the images here are in the public domain; should you happen to know otherwise, please contact me and I will remove them immediately. On the left and above are illustrations by Edmund H. Garrett for Frances Nimmo Greene’s 1901 Legends of King Arthur and His Court. 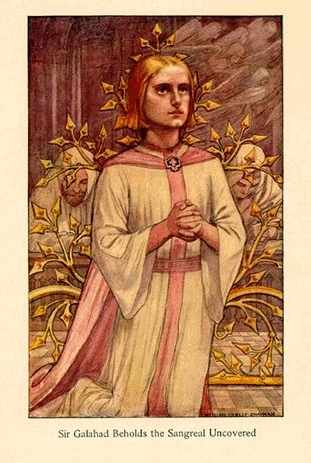 The girlish appearance of Galahad is common in illustrations from this period: compare Chapman below. The painting on the right is Sir Galahad, painted in 1888 by British artist Sir Joseph Noel Paton (1821-1901). 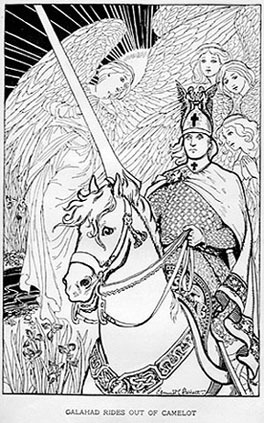 The illustration on the left is by William Ernest Chapman, for Mary Blackwell Sterling, The Story of Sir Gahalad (1908). 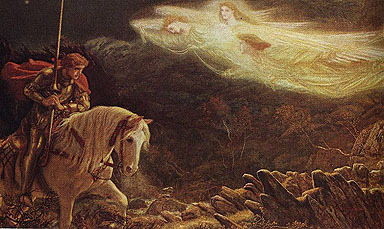 The painting above is Sir Galahad, painted by British artist Arthur Hughes (1832-1915) c. 1865-1870; the back of the painting is inscribed with lines from Tennyson’s poem. Henry Albert Harper was a journalist and civil servant. He was born in Cookstown, Ontario, in 1873. He was a friend of William Lyon Mackenzie King, and eventually worked for King at the Labour Gazette. On December 6, 1901, Harper jumped into the Ottawa River in a vain attempt to save the life of Bessie Blair, who had fallen through the ice. He and Blair both drowned. 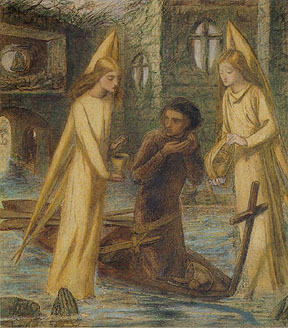 Harper and King were both fond of Tennyson’s Arthurian poetry, and one tradition has it that Harper quoted Galahad before he jumped into the river in his attempt to save Blair. King commissioned the sculpture of Galahad to commemorate his friend. 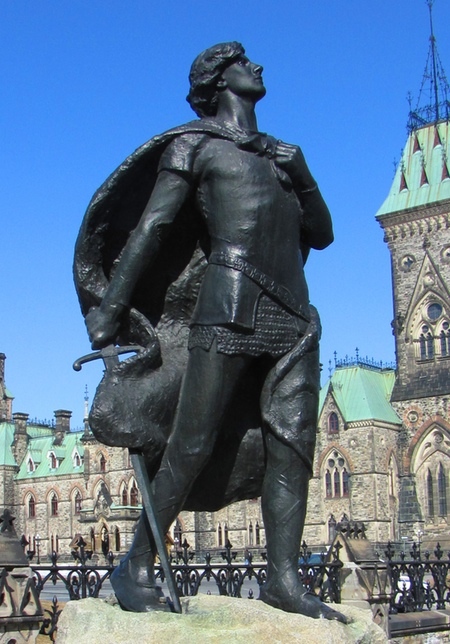 It was the work of Ernest Keyser, and was unveiled on Parliament Hill in 1905. Read the Dictionary of Canadian Biography entry on Harper. It is rather snide about what it calls Harper’s “priggish idealism,” but gives the basic details of his life. For a more sympathetic account of the history of the statue, see the Ottawa Citizen series Stories in Stone. The photo, by D. Gordon E. Robertson, is made available through a Creative Commons license.